Book your hotel in Vallehermoso. 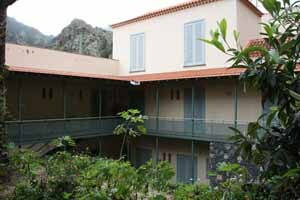 From here you might book in some of the best Hotels in Vallehermoso, in the island of La Gomera in the Canary Islands. Discover how are the hotels in Vallehermoso and book your hotel online at special prices. To book now, select the dates of your trip and click on the hotel for more information. Holiday home Calle Tazo is located in Vallehermoso. The accommodation is 26 km from Valle Gran Rey. The 1-bedroom holiday home comes with a living room with satellite TV and DVD player, and a fully equipped kitchen with oven. Holiday home Calle Tazo - 2 is situated in Vallehermoso. This holiday home also features free WiFi. The property includes a living room with a TV. The accommodation is fitted with a kitchen. Valle Gran Rey is 26 km from the holiday home. Casa rural Los Bellos is located in Vallehermoso. This country house provides accommodation with a terrace. Situated in Vallehermoso, Casa Gerian offers accommodation with free WiFi. Valle Gran Rey is 31 km from the lodge.